Airmax® TrueRock™ Covers - Airmax® Inc. This amazing fiberglass rock cover looks and feels like the real thing! It’s by far the most realistic rock cover on the market. 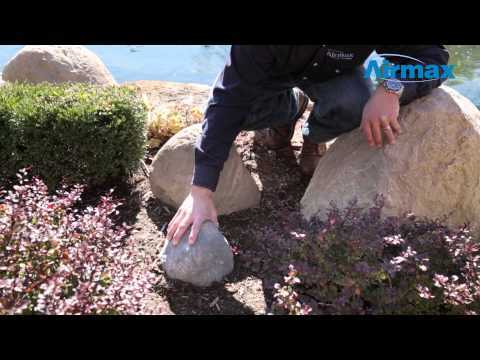 The TrueRock™ Cover blends beautifully into any landscape and is the perfect solution for hiding aeration compressors, skimmers, waterfall boxes or anything unsightly. Each TrueRock™ Cover is made and hand-painted in the USA, so every rock is unique. The TrueRock™ Covers come in Sandstone and Greystone to match any landscape. Please note: These rocks are irregular in shape. The internal measurements should be used as a guide for how large an item will fit under the rock. If the measurement is close, we recommend going up a size.